The Curtain Enclosed Booth Setup is used indoors. Inside the enclosure a backdrop can be setup. The Tent Enclosed Booth Setup can be used indoors or out. Inside the enclosure a backdrop can be setup. The Open Concept is just that not enclosed and guests can watch and see as the pictures are taken. 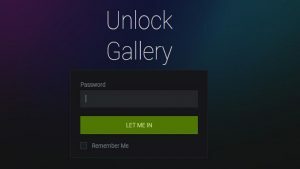 There is a variety of backdrops that can be selected. The Standard Curtain used for events is a Navy Blue. 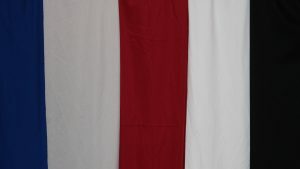 This also the standard curtain displayed in the Curtain Enclosed Booth. Shiny Sequins can give a little sparkle to any event. Currently available in Gold and Silver. If there is another color that would brighten your day let us know. 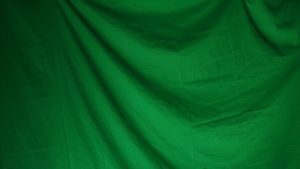 Green Screen option would be used throughout the night. 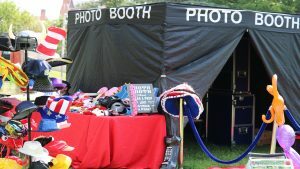 The booth can be programmed with a menu for up to 8 options of 4 backgrounds each for up to 32 separate backgrounds designs. Just give us the theme and we will provide the dream. 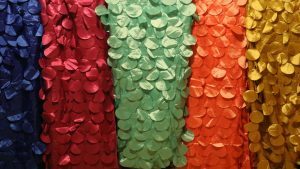 Coming soon their will be multiple Petal Taffeta Backdrops to choose from. 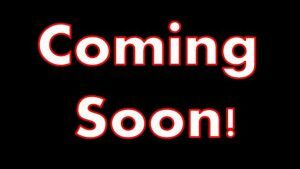 Coming soon their will be multiple Rosette Backdrops to choose from. 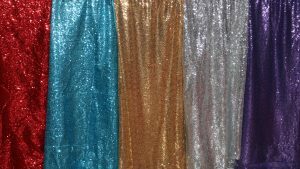 Coming soon their will be some miscellaneous style curtains to choose from. When we create a design for the Skins and Photo Strips we asks for a little help with what the theme is including the color selection. For example if wanting something like Sweet 16 colors may be Pink, Purple, or White. 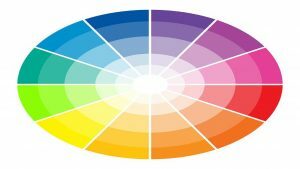 As long as we are provided 3 main colors to work with we can design something special. 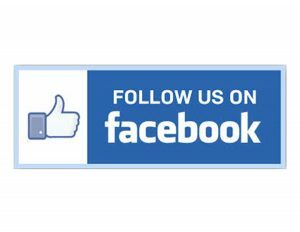 If you don’t know at all, no worries we will consult you about the look you are wanting and decide off that discussion. Based on the color selection you decide if you provide that we can create a Skin that would meet your theme. Also if you are celebrating something special like a birthday or anniversary we certainly will include that. 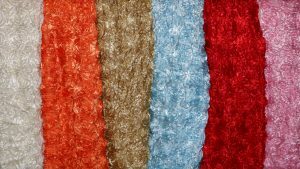 Based on the color skeleton we will create strips that match your theme in the Skin. 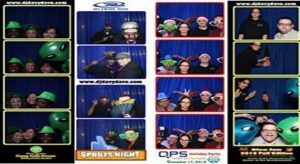 Up to 4 photos can be seen on a photo strip, the entire border, background, and even logos can be created for the event. Need a hat to go with that pose, well we have one that will suit your needs. 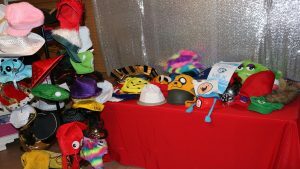 We have everything from fedoras, cartoon and gaming characters, to even the Taxi Cab driver hat. 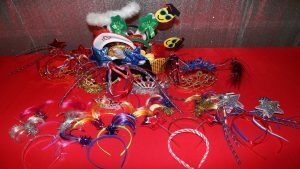 There are many Head Pieces to choose from. We have the Halo to something wacky like the streamer type. These are always a hit, quick to put on and easy to take off. Need a wig like an afro or Mohawk we got both. 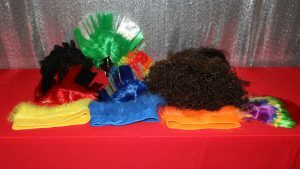 There are a variety of bandana type hair pieces to try as well in different colors. You just might have an urge to put on a mask. 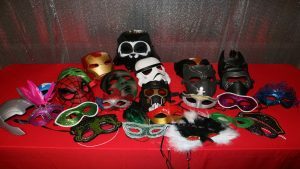 We have many masks to be that villain or that super hero. If you so choose you can just masquerade like mardi gras. 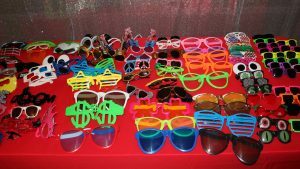 Feeling shady grab some glasses to enhance the fun. As you can see there is more than enough selection to give multiple poses and looks. 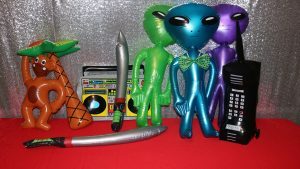 Don’t let the aliens get you and be abducted. Grab a blow up sword and put on a pirate hat. If you want to relive the 80’s and 90’s grab the Boom Box and the Mega Cell Phone. 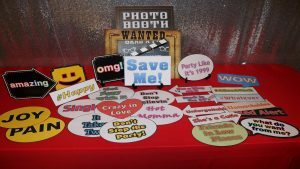 Want to add an exclamation point to a Photo Booth picture. 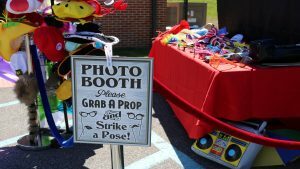 Grab a prop, a sign, and strike a pose. Many signs to choose from we can even customize for your event. 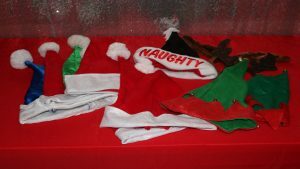 Looking to celebrate the holidays there are plenty of fun props to choose from. Each year we add a few here and there never know what Santa may bring. 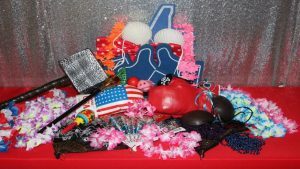 There are dozens of fun odds and ends to choose from for the Photo Booth Prop fun. To name a few there are boxing gloves, leis, Like hands, the hammer, bow ties, and of course Chinese style fans. 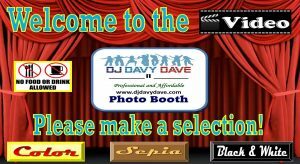 After all four photos are taken during the photo booth session, 2 separate strips will print. In some events 1 copy will go into the gift book and one for the one taken the picture. However, more copies can be printed at the booth at the time of session if requested. Business Cards are given to guests that provide an access page (link) and password for the event. About 24-48 hours after the event, online access will be available for guests to view, download, or print the photos. 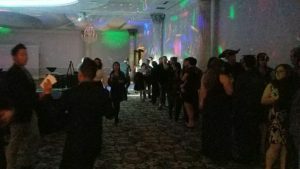 All the photos taken from the photo booth during the event will be uploaded to a USB drive and mailed 24-48 hours after the event to the address provided at time of hiring.